Recently I’ve gotten super into this whole organic skincare thing. You know, you are what you put on and in your body, or whatever. The thing is, I thought it was all hullaballoo until I did some reading that made the concept of putting toxins and chemicals on my clothes seem bad, much less in my skincare routine. I fell down an organic skincare rabbit hole and have been reworking my regimen ever since. Which brings me to May Lindstrom. Known widely as the crème de la crème of luxury organic skincare, it seemed like the obvious place to start on my search. 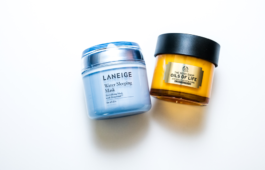 And while there are several of Lindstrom’s products worth writing about (a lot of attention is paid to The Honey Mud Cleanser and The Clean Dirt Clay), as a walking advertorial on the effects of dry skin, I fell instantly in love with The Blue Cocoon. What is it, you might ask? Good question. The answer? So. Many. Things. Intensely moisturizing, it melts into skin on contact and calms, nourishes, and softens with an anti-inflammatory concoction of blue tansy, botanicals, and oils. It’s dubbed a beauty balm instead of a moisturizer, so don’t necessarily use it as a substitute. But do melt a half-pea sized amount into wet skin, morning and night, focusing on areas of sensitivity and the delicate eye contour. May also sings its praises as a lip treatment. What’s more? It smells as good as it looks. With lavender, rose geranium, and frankincense, there’s also an aromatherapy element for relieving anxiety. Jackpot. Needless to say, I’ve been carrying this one around with me everywhere and it’s on it’s last leg. But when you are a sucker for beauty products like I am, the true mark of a good one is when you finally see the bottom. Who doesn’t love a product that can be used for just about anything?